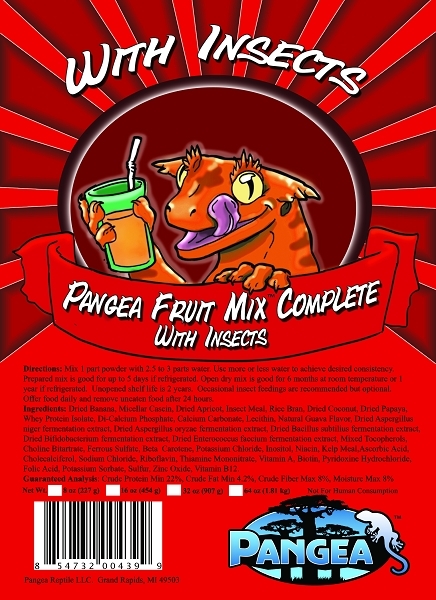 Pangea Fruit Mix With Insects. Panges set out to create a gecko diet that incorporates insects as one of the main ingredients and generates an enthusiastic feeding response. 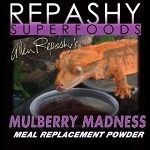 I think we have succeeded, in fact I'd say this is our tastiest and most widely accepted formula so far! The insects we use in the food are North American farm raised and certified Organic. Researched, developed, and tested for two years here at Pangea on one of the largest collections of geckos in the world. Formulated to contain the lowest levels of oxalates and other anti-nutrients to ensure optimum calcium absorption for strong bones and great egg production. Our combination of protein sources delivers an amino acid profile second to none!